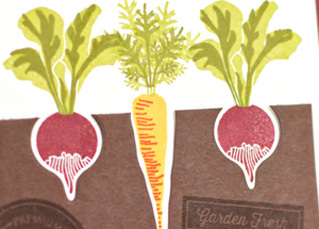 Today the PTI team is featuring the new "Vegetable Garden" stamp set and dies that are being released at www.papertreyink.com on June 15th, just in time for some summer time projects. Nichole designed them to work well with the previously released "Garden Variety" and "Garden Variety II" sets. I've got a card using them with the companion sets and one featuring just the veggies. So let's get to it. First up, I'm featuring one of my favorite veggies--the asparagus bunch. I die cut four of them and stamped them in three steps (the stalk, the tip, and the twine). Three of my bunches when in a basket from "Vintage Picnic" and the fourth one is placed outside to show off the whole stamp. I've got the fork and spade from the original "Garden Variety" set. The sentiment is from Maile's new "Bigger Blooms". I've often heard of farm fresh veggies being referred to as "sweet" in taste so this is an appropriate pairing of sentiment and image.. I had some fun with the Vertical Chevron Cover Plate also being released. Just changing it up a bit. I layered two cuts of the cover plate on top of each other. A Lavender Moon Bitty Dot cut adhered over a Plum Pudding cut, slightly off center. 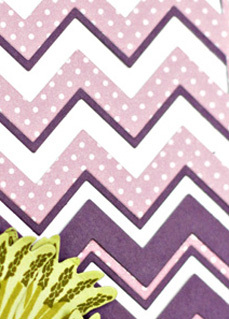 It creates a two-toned chevron look. Take it even further by layering the negative die cuts from the Plum Pudding cut over the Lavender Moon cut for a triple stripe. Lots of possibilities there. How do you like your asparagus? I could eat a pound of it in one seating, without a problem. Roast it in the oven at 425 degrees, doused liberally with olive oil and sea salt for 9 minutes. Yummers. And did you know this fun asparagus fact? You can eat it with your hands/fingers at a fancy dinner and still maintain your good manners. But only if it is unsauced. Only veggie you can do that with. I'm just a wealth of veggie facts! Next up, some "Vegetable Garden" flying solo without the aid of the companion sets. We have here a little vegetable bed with radishes and a carrot. My Dark Chocolate panel is stamped randomly with two labels from the set. I heat embossed in gold "Happy Spring Birthday" from the previously released "Spring Hills". Limitless Layers Ovals and Photo Finisher Strips help to set off my message. A fun little detail can be seen here in close up. I used the radish and carrot dies to cut into the Dark Chocolate "dirt". The negative shapes allow for me to stamp my veggies directly onto the Vintage Cream base. Just some fun dimension. That's it for me tonight. Find more veggies to feast your eyes on at the following blogs. And remember, this set and many others are available for purchase on June 15th at Papertrey Ink. Oh my!! Erin, your cards today are absolutely fabulous. I can't wait to "play" with Vegetable Garden. Leave it to you to make my favorite 'dirty' card! That is so clever, and I love how you stamped on the dirt, and cut out the veggie holes. And the asparagus card!!!! Love the basket with the bunches, and I'm over the moon about the purple chevroned card base. It really sets up the green without overwhelming it. Thank yo for your fabulous takes on this must-have set! Beautiful cards Erin! I love the 'dirt'! So very clever of you! 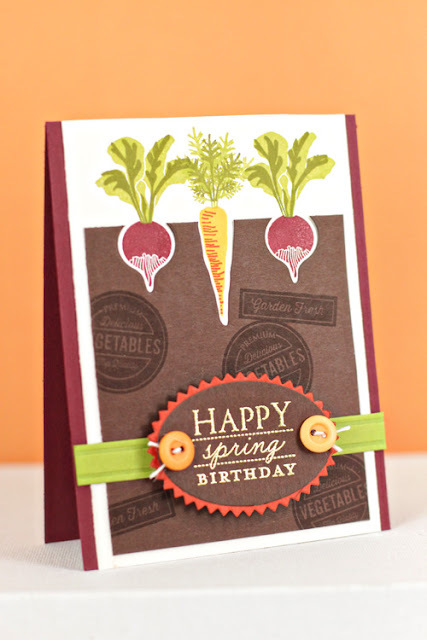 I love your card where the veggies are growing in the card-- so creative and fabulous! Asparagus in the picnic basket! Love it! And root veggies popping out go the dirt. Oh my, you've done it again! WOW...such gorgeous and fun cards..LOVE Them ..great ideas the picnic basket and the veggies in the soil.....love it!!! Love the idea using the picnic basket how smart!!!! Love your "planted" vegetables and also the green and purple together. Nice chevroning, too. What fun! Love your little garden patch. Thanks so much. Glad to get the "dirt" on your cards - they are wonderful! Love how you "planted" the veggies! Great idea placing the asparagus in the picnic basket with the gardening tools. Agree 100% about roasted asparagus ~ it's the best! Such a clever idea to show your veggies growing in the dirt ~ fun, fun, fun! 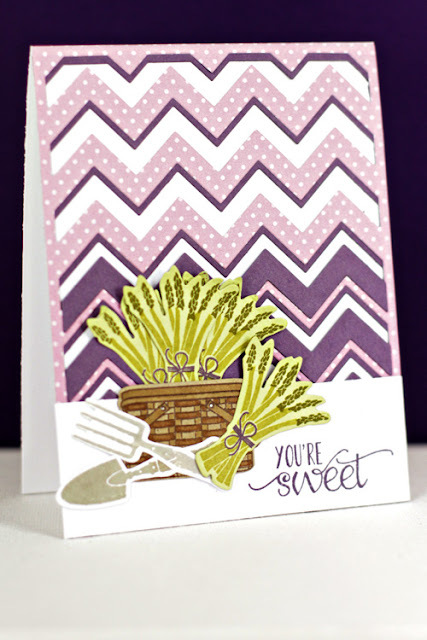 Ahaa - thank you, for the trivia :) Now your cards..... absolutely lovely, LOVE what you did with the chevrons!